Arsenal attacking from the start and pushing the visitors back but only winning a few corners where the ref sees a foul as the Napoli defenders fall for dead on the floor from the slightest contact. A good attack after some high pressure up front sets up Ramsey and Maitland-Niles but twice Koulibaly blocks the shots. Napoli have the ball in the net but the striker was around 5 meters offside so the flag went up. Koscielny has to clear a possible dangerous cross but the corner is headed meters over. Arsenal attack from the half way line and with some slick passing between Özil, Ramsey, Maitland-Niles, Lacazette the latter puts the ball perfectly to Maitland_niles who picks out Ramsey with a back pass and the Welshman makes no mistake and burries the ball in the net. GOAL! 1-0 to The Arsenal after 14 minutes. Aubameyang goes down after a small push in the back in the Napoli penalty area but the ref ignores it and waves it away. Not much difference with the small fouls that he penalised us for with our corners. Torreira wins the ball back in the Napoli half and takes a shot that is deflected off Koulibaly and goes past the keeper. GOAL!! 2-0 to The Arsenal after 25 minutes. A well taken corner is given to Kolasinac who sets up Aubameyang but his shot is saved by the keeper. Arsenal dominating proceedings most of the time. Still 2-0 after 30 minutes. Kolasinac with a deflected cross but it falls in the arms of the keeper this time. Aubameyang intercepts a bad ball from Napoli but Lacazette completely misses his shot. Özil takes a free kick that leads to some problems in the Napoli penalty box with a shot from Ramsey but in the end a foul from Monreal is punished and the attack is stopped. Aubameyang with a shot that is half spilled by the keeper but he can smother the ball just in front of Lacazette. Maitland-Niles with a fine pass to Aubameyang but his lob is stopped by the keeper. A back pass from Ramsey goes to a Napoli striker thatwas coming back but luckily the shot goes over. Maitland-Niles with a great tackle on the ball when he was two against one. Özil beats 4 man but the 5th is too much. A pitty as that would have opened things up in front of him. Napoli with their first real chance as they have a shot from around the penalty spot but the ball goes very high over the Arsenal goal. At the other end Lacazette with the cross to Aubameyang who gives it back to Ramsey but he had to stretch too much to produce a good finish. Half time after a near perfect first half from The Arsenal : 2-0. No changes for Arsenal at half time. Hysaj from Napoli gets a yellow card for making 3 fouls in 2 seconds in the first minute of the second half. Napoli win a corner but Sokratis can clear the loose ball. Napoli sure look like they want to attack more and get out under the Arsenal pressure like they suffered in the first half. Napoli have the ball in the net but again the player was meters offside and the assistant did his job. Napoli win two corners in a row but the second time the ref penalised the push from the Napoli striker so very consistent in this. Arsenal not as dominant as they were in the first half so far in the opening 10 minutes. Aubameyang tries a shot after being set up by Özil but a defender blocks his effort for a corner. The corner is taken short and Kolasinac sets up Ramsey but the keeper with a stunning save. Monreal heads the following corner over. Still 2-0 after 60 minutes. Napoli with a cross but Monreal clears the ball. Lacazette with a chance after a good pass from Maitland-Niles but he was offside. Mkhitaryan and Iwobi enter the field and Özil and Lacazette are taken off. Arsenal playing with a high line in defence so with lots of space to run in to but suddenly Kolasinac is on the run and his cross is touched by the keeper and then Maitland-Niles has a shot but again the keeper pushes it over. Napoli with a long ball on our left flank and the cross finds a completely unmarked Napoli player who misses the goal from 7 meters out. A very even match now with both teams trying to add to the score line. Ramsey with a great effort sets up Kolasinac with a backheel but his shot is blocked. Elneny is also getting ready I think to come on for Torreira who looked to be in a bit of trouble a few minutes ago. Still 2-0 after 75 minutes. As I said Elneny on for Torreira after 77 minutes. I must say up to now the assistant-referees are doing an excellent job with judging the offsides. Let us hope they keep this up till the end. Mkhitaryan with an excellent cross to Ramsey who fires over from 8 meters out completely unmarked. What a miss. Koscielny with a good interception when Monreal can only half touch the ball. Napoli has a shot after the corner but no problem for Cech. Napoli pressing forward to score that away goal but luckily Cech can fist a shot away. Arsenal counter with Mkhitaryan who gives it to Aubameyang but his shot is off target. Mkhitaryan plays a blind ball in order to start a counter for Arsenal but a Napoli player intercepts and it leads to a shot for Napoli but off target. Koscielny has to go off with a head wound after Cech made contact with his head but he comes on quickly. Still 2-0 after 90 minutes. 4 minutes of extra time. Koscielny goes down with cramps but he quickly gets back on his feet to not waste time and having to go off. Final score 2-0. Really outstanding first half and we did enough in the second to keep the clean sheet. If we mind our business in the return leg we have the capability of getting a goal on the break which should be enough to see us through. Good job guys. Make haters like Owen choke on their own rubbish. Two goals, clean sheet,a good win. The only regret is that the margin wasn’t bigger by at least one goal. Why Ramsey and Auba miss so many scoring chances is beyond me. But then, a win is a win. Not a bad way to be in for the second leg, which is not done and dusted yet. But given the way we pinged Napoli to submission, we might give them some problems in the second leg in Naples. WOO HOO , HOO ! Well done guys , and with a clean sheet to boot. Did not see the game , but from Walter’s match report , it seems we could have had more goals as a further advantage. Hope we get the job done there without too much fuss . Kolasinac seems to have been all over the pitch , if Walter’s line up is to be believed ! 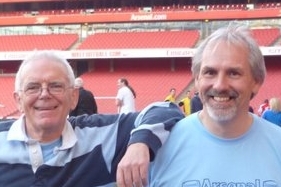 And ,….Up the Gunners !